When we think of easy-to-handle, portable fiber arts, weaving does not immediately spring to mind. 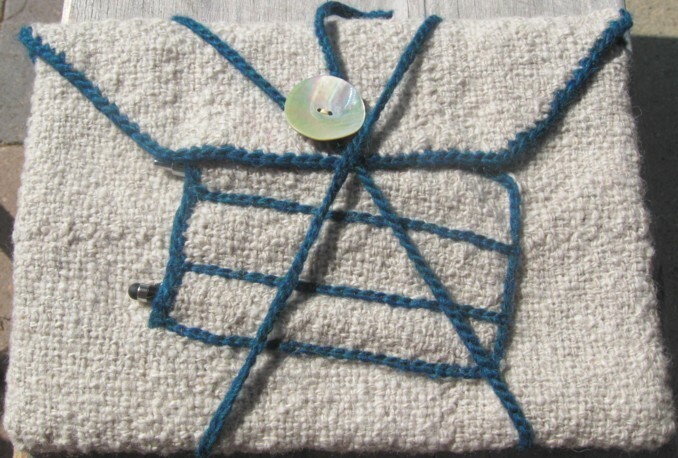 However, a pin loom (and all the tools needed to weave on it) can be carried in a small bag! Not only that, but weaving on a pin loom offers an immediate payoff. Unlike a standard loom, there is barely any setup, and with a little practice a square can be woven in ten to fifteen minutes. It is thrilling and fulfilling all at once. 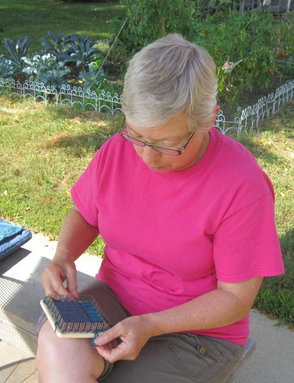 Weaving the squares can offer an incredibly effective way to unwind, relax, and focus. The repetitive movements ( as with other forms of weaving) can deliver a state of calm, relaxed alertness. This is the state of awareness that allows your body and mind to regroup and restore. This is where focus and creativity live. And who isn't interested in a bit more of that? Pin looms have changed a lot over the years, but they still remain true to their basic function: weaving. "The Weave-It Book." Medford, Massachusetts: Donar Products, Corp., 1936. The first books of pin loom patterns came out in 1936. This was at a time when a lot of women's clothes were still being made at home. The primary focus in the early books was on clothing for adults and children with home decor items coming in second. You can see a wonderful sample of these early books and patterns at www.eloomaation.com as well as access an incredible reserve of pin loom information. You can purchase a Pin Loom at the Woolery here. Looking at the early books, its hard to remember that folks were just as interested in color and style as today's weaver, they just didn't have access to affordable color printing - so you have to use your imagination. Pin looms and pin loom pattern books seem to have been an active part of the handcrafting scene through the 40's and 50's. Life Magazine had illustrations of World War II soldiers using pin loom weaving as part of their rehabilitation. At least a few of the Minnesota county fairs had specific categories for pin loomed items. But then the 60's came along, and the pin loom's popularity fell away and the Scoville factory that manufactured the pin looms burned down. There did not seem to be any reason to rebuild it. That might have been the end of the story for pin looms except that even as interest in old fashioned home arts faded, a new passion for self sufficiency was taking off. This included raising fleece animals and spinning. As the move toward natural, hand crafted items took off, the pin loom was discovered to be a perfect sample loom. A third pin loom transformation occurred very recently with Schacht Spindle's decision to work with John Mullarkey to design and construct the Zoom Loom, a pin loom which incorporates all the original functionality of the pin loom with an updated, easy to use style. The Zoom Loom has been largely responsible for reintroducing the pin loom to an avid fiber audience, and has helped me to share my pin loom patterns with both experienced and novice pin loom weavers. One of the challenges for many new pin loom weavers is that while it is easy to weave the square, it is not always clear how the squares can be joined together to create a larger project. There are a number of ways that all work very well, depending upon the purpose of the item, and you can find a number of basic joining techniques here. 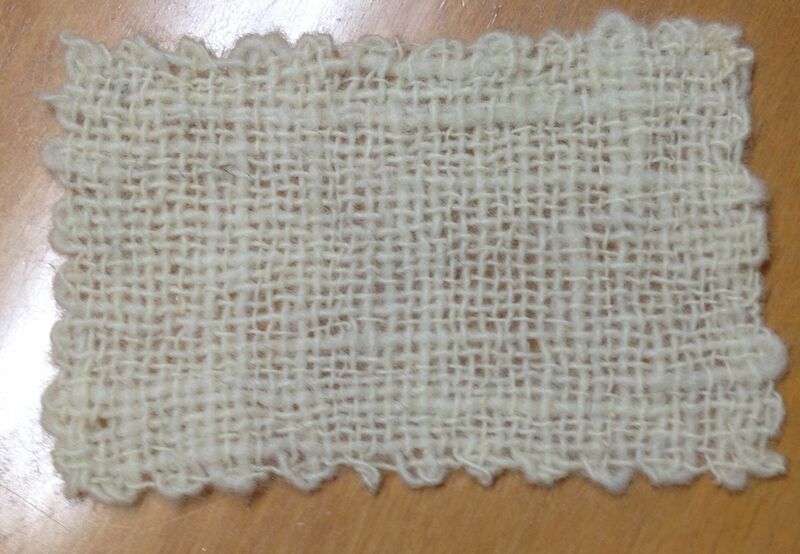 For example, this tablet case was joined using a mattress stitch. It offers a swift, smooth way to join squares, but the caveat is that it works best on seams that are not going to get a great deal of stress. On the other hand, these sheep and cow toys were joined by using a single crochet stitch to join the seams, which were then turned to the inside. I will use a single crochet join anywhere where its okay to have a very noticeable or protruding seam, for example if the seam is to be a part of a purse embellishment, or when the crochet join is going to be turned to the inside and will not show at all, like with stuffed animals. Pin looms have a rich history and an exciting future as artists and craftspersons begin to express themselves in this new medium, finding her or her own pin loom "voice." 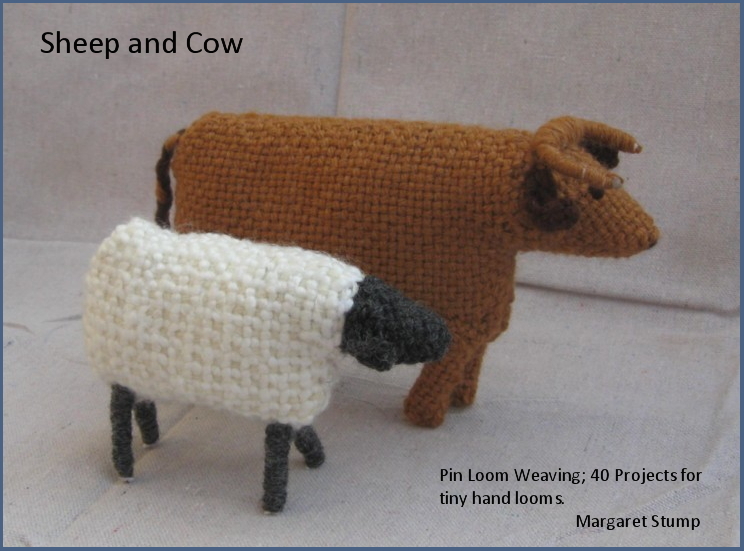 Margaret Stump is the author of the newly published, Pin Loom Weaving; 40 Projects for Tiny Hand Looms. She lives with her husband, Jerry, in Mankato, MN, and spends far too much time thinking about what she is making and what she might make on her pin looms. Margaret, also known as Meg, can be found at www.PinLoomWeaving.com where she is attempting to compile everything she knows about pin looms as well as everything that she can request from others to share. 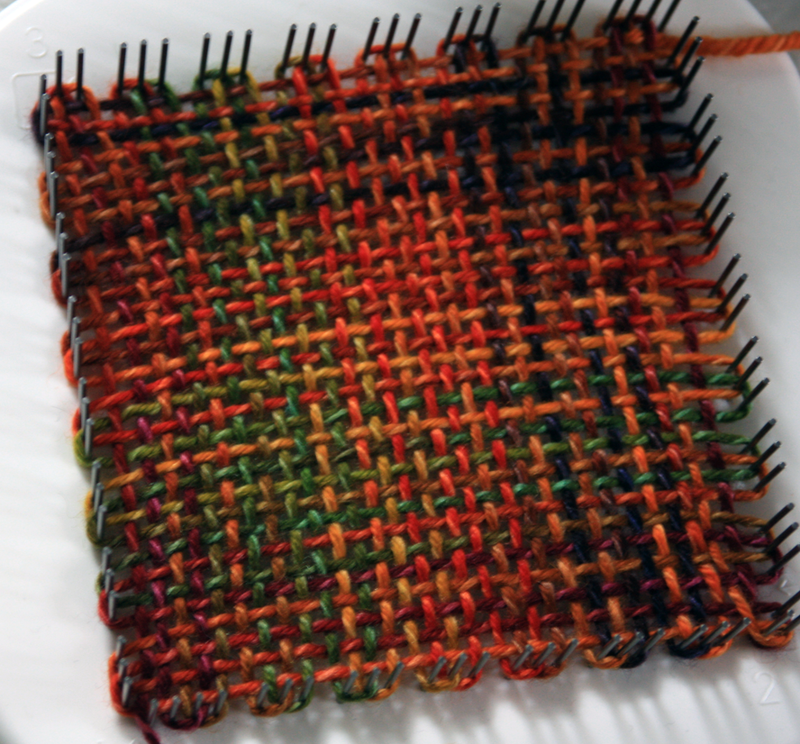 For example, Meg is very interested in posting examples of other people’s finished and unfinished pin loom projects, along with any comments on their own weaving/creative process. These will go up in a Gallery Page as soon as there are a number of examples. She can be reached at pinloomweaving@gmail.com and would be happy to chat about pin loom weaving.